Do historians always look at the past? Not always. Some historians conduct research on how conceptions of the future have changed over time. If that doesn’t make sense, think about the common observation that the future isn't what it used to be. That's where historians come in, to ask how it changed and why. There are many ways to look at how the future has changed, and last week at the annual conference of the Society for the History of Technology in Tacoma, Washington, University of Texas historian Laura Jacquelyn Simmons analyzed the case of The Jetsons, the 1960s cartoon show that featured a family living an automated life in 2062. The head of the family, George Jetson, pushed buttons at Spacely Space Sprockets and was the sole breadwinner for his wife Jane, teenage daughter Judy and younger son Elroy, their dog Astro and robot maid Rosie. The Jetsons' flying cars and space needle architecture never came to pass. But George Jetson was subject to constant and capricious surveillance by his boss, something that has come true for many harried workers. And Jane Jetson still found it a challenge to feed her family, even with a push-button pantry. While many of the changes portended by The Jetsons didn't become reality, the series depicted gender and family roles that are now outdated. And it missed many other changes that were never envisioned back in the 1960s. Take this article for example. It was written on a personal laptop computer that has arisen instead of the widely anticipated mainframe computers like 2001's Hal. This article was commissioned online in response to a posting I made on the popular social networking website Facebook, whose popularity few would have predicted even a decade ago. Anyone anywhere with internet connections can read this article today, not just those who get the Times Colonist delivered to their doorsteps. So why do technologies advance in unexpected directions? That's why historians and other social scientists such as sociologists study technology. Historians are no better than anyone else at making predictions, but they do look for common threads and forces that drive change, be they political, social, economic or technological, that might help point the way for emerging technological systems. Think of the arguments regularly featured on the pages of the Times Colonist about our transportation infrastructure, which is a big and expensive technological system. Why is there is a “bridge to nowhere” in Langford, an airport overpass under construction, but nothing to relieve congestion on Highway 1 at Mackenzie? These topics generate many arguments, including historical ones. And historians of technology do look into the past to see how technologies helped turn historical events. David Zimmerman, a military historian at the University of Victoria, told the Tacoma conference about new ideas on the impact of tanks, trucks and machine guns in World War I. My own historical research deals with the history of space exploration, a key part of the future envisioned in The Jetsons. Back in the 1960s, many people looked forward to seeing astronauts on Mars before the end of the twentieth century, but in fact no one has ventured beyond low Earth orbit since 1972, and only robot vehicles have explored Mars and the other planets and moons of our solar system. Humans on Mars seem as distant today as they did back in the days of the Apollo moon landings. A couple of reasons for the dashed dreams of space cadets came up during the presentation on The Jetsons. The original series only ran one season, because it was not especially popular, and indeed historians have found that the space program of the 1960s was not really that popular either. Why? 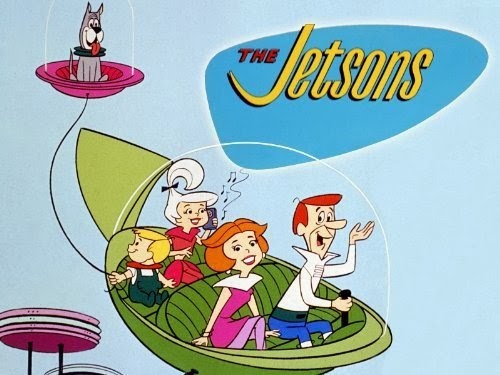 One member of the audience at the Jetsons presentation observed that she hated The Jetsons because the series envisioned lives totally divorced from the Earth – a future apparently without forests, gardens or nature. Environmentalism, amongst other things, has trumped space travel. Yet The Jetsons television show was revived in the 1980s, and the Jetsons themselves remain popular cultural characters. Astronauts still rocket into space, and the dream of trips to Mars has not died. Many chapters remain to be written on the history of the future. 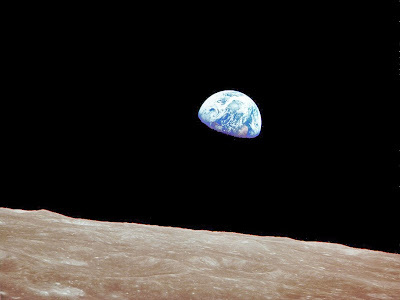 Earthrise over the moon as photographed by the crew of Apollo 8 on December 24, 1968. On Christmas Eve 1968, my family gathered around the television set as usual to watch the classic Alastair Sim version of A Christmas Carol. But this was no ordinary Christmas, for the movie was interrupted for a special broadcast from lunar orbit. The three astronauts of Apollo 8 showed views of the bleak surface of the moon, and taking account of the occasion, they wrapped up their broadcast by reading the first verses of Genesis. While the first Moon landing on Apollo 11 is the best remembered moment of the 1960s space race, the flight of Apollo 8 on that Christmas 45 years ago is just as memorable. This was the first space flight to carry humans away from low Earth orbit and the first to take humans into orbit around the moon. The astronauts saw and photographed many unforgettable sights - most famously the whole Earth in the blackness of space. Apollo 8 was originally planned to be the first test flight of the full Apollo spacecraft, but delays in production of the lunar module meant that the flight as planned would face lengthy delays. NASA officials were also informed from intelligence sources that the Soviet Union was pushing hard to send cosmonauts around the moon and steal a march on the Americans in the race to our closest celestial neighbour. The solution to both problems was to launch Apollo 8 into lunar orbit with a command and service module but no lunar module, preserving Apollo's schedule and protecting the American lead over the Russians in the space race. The decision was controversial inside NASA, but Apollo 8's commander, Frank Borman, agreed to the plan on behalf of his crewmates, James Lovell and Bill Anders. The flight would be highly dangerous - it would be the first crewed flight launched by a powerful Saturn V rocket, and the crew's flight around the moon would lack the extra margin of safety provided by the lunar module, a margin that would later save the lives of the Apollo 13 crew. Apollo 8 lifted off on schedule on December 21, 1968, from the Kennedy Space Center. Two hours later on its second orbit of the Earth, the Saturn's third stage engine lit up and sent Borman, Lovell, and Anders to speeds and altitudes never reached before by humans. After the astronauts tried but failed to show the whole Earth as part of their first television broadcast the next day, their broadcast on December 23 featured views of Earth as a distant planet. As the astronauts neared the Moon, each realized that they could hide the Earth - including everyone and every place they knew and loved - behind their thumb. On December 24, Apollo 8 passed behind the moon and fired its engine to put the spacecraft into lunar orbit. For the next 20 hours, Borman, Lovell and Anders made ten orbits of the moon during which they scouted out landing sites for future Apollo spacecraft, beamed two television shows back to Earth, the second one capped by the famous Genesis reading, and photographed the moon's bleak surface. And in an unplanned initiative, the astronauts also photographed the Earth rising over the lunar surface. In the early hours of Christmas Day, Apollo 8 passed behind the moon for a final time. Its engine sent the spacecraft on its way back to Earth, although anxious controllers in Houston had to wait about a half hour to get the news until Apollo 8 came out from behind the moon. On their way back home, the astronauts broadcast more images of their home planet, but it was only after they splashed down in the Pacific Ocean on December 27 that the splendid colour photos of the Earth, the stark shots of moon, and the iconic image of an Earthrise were developed and published. Seven months later, Neil Armstrong and Buzz Aldrin followed the trail blazed by Apollo 8 and traversed the final 100 kilometres to the lunar surface. Four years after Apollo 8, the Apollo program was over, and humans have been confined to Earth and low Earth orbit ever since. Although the moon has been quiet in the four decades since the last Apollo headed home, the landing of China's Yutu lunar rover on December 14 recalled past lunar exploits and holds the promise of new ones. It has often been said that the flights of Apollo were planned to explore the moon, but they helped humans better appreciate the Earth. That idea is especially true in relation to Apollo 8. Regardless of what the future of space exploration has in store, it will be difficult to duplicate that week 45 years ago that married the joy of Christmas with the mystery of humanity's first closeup view of another celestial body. My home town of Victoria B.C. is a world centre for astronomical research. The Dominion Astrophysical Observatory (DAO), Canada's premier astronomical research institute, is located on Little Saanich Mountain just north of the City of Victoria. Not too far away is the University of Victoria Physics and Astronomy Department, which also generates cutting edge research. In 2014 we will celebrate the 100th anniversary of the start of construction of the two-metre Plaskett Telescope at the DAO, which for a few months in 1918 was the largest working telescope on Earth. We will also mark the 100th anniversary of the Victoria Centre of the Royal Astronomical Society of Canada (RASC). Although important research is still done on the Plaskett Telescope, the focus of DAO astronomers' research work has shifted to larger, better located and more up-to-date instruments in Hawaii, Chile and even outer space, where the Hubble Space Telescope and other astronomy satellites operate. Astronomers and other DAO staff, who are employed by the National Research Council of Canada (NRC), also design and build highly advanced equipment that is used in all these facilities. In an effort to help the community learn about the scientific research going on at the DAO, the Centre of the Universe educational centre was opened in 2001. It includes an interactive museum about Canada's astronomy efforts, a lecture room, a small planetarium, and telescope facilities. Since then, thousands of people, many of them young people, have had their eyes open to Canada's role in the exploration of the universe. Despite the great programming offered at this educational outreach centre, receipts failed to come close to covering the salaries of the skilled educators who worked there and other operating expenses. In the wake of the sponsorship scandal a decade ago, restrictions on advertising by federal government agencies meant that the Centre of the Universe couldn't advertise its programs. In late June, the NRC announced that the Centre of the Universe would close down at the end of August, which duly happened. The reasons included budgetary restraints and a new mandate from the Harper government for the NRC to focus on immediate economic returns, topics I will discuss in later blog posts. The educational mission of the Centre of the Universe didn't fit in with those imperatives. The NRC's decision to close the Centre of the Universe has proved to be very unpopular both in Victoria and among informed people elsewhere in Canada. Two petitions obtained thousands of signatures, and large numbers of people who came to the Centre last summer got a taste of its programs before it closed. This reaction has helped bring the community together to reconstitute the Centre of the Universe under new management. While the government of British Columbia has remained silent in the face of calls for help, an opposition member of the BC Legislature, Lana Popham, put politics aside and pulled together a meeting of various groups and individuals from around greater Victoria to begin this work. A plan emerged from the meeting to resume public astronomical viewing at the Centre on Saturday nights during the warmer times of the year using the telescopes of RASC members. The NRC will help by providing security and by making it possible for visitors to tour the Plaskett Telescope. RASC Victoria's tradition of public outreach at the DAO goes back decades, long before the opening of the Centre of the Universe. The University of Victoria, which provides science programs to school age students through its Science Venture program, is also in discussions with the NRC about picking up programming aimed at children. These two initiatives are just a start. The community representatives at the November meeting recognized the need to create a non-profit organization to run the Centre of the Universe. As well, work is beginning on a longer term plan to make programming at the Centre of the Universe economically sustainable. I am involved in the work to bring back the Centre of the Universe in my capacity as an active member of the RASC and as a member of one of the working committees formed at the November community meeting. I will provide updates in this space about the work to bring back the Centre of the Universe. We cannot depend exclusively on schools and other formal educational institutions to ensure that Canada has the scientists it needs in the future. We also need places like the Centre of the Universe to inspire younger people to look to careers in science and to inform other people who need to better appreciate the work done by our astronomers and physicists. In a time when governments are making short-term and shortsighted decisions on a daily basis, community groups are being compelled to step up to preserve important services. The Centre of the Universe will show how much our community values scientific research, education and inspiration. A year and three days after former Conservative and Liberal cabinet minister David Emerson released his two-volume report on Canadian government programs relating to the aerospace sector, Industry Minister James Moore issued a statement on Monday containing the Harper government's formal response to Emerson's recommendations on the space sector. This was potentially an important moment for Canada's space program, because nearly two decades have elapsed since the Canada has had a long term space plan, and since then neither the Harper government nor its Liberal predecessor gave much indication of what direction they wanted our space program to go. Probably the most important part of Moore's statement on Monday was a promise to issue a Space Policy Framework for Canada in "early 2014." Once more the space policy can is being kicked down the road, but not too far. The timing suggests that the framework could be released in tandem with the 2014 federal budget, which would mean that the space program remains hostage to Finance Minister Jim Flaherty's budget cutting priorities. Moore's statement said the Canadian Space Agency's core funding would be "stabilized," and that other sources of funding be found for major space projects. This after more than a decade of the space agency's budget being frozen at $300 million a year until it was reduced by $25 million a year over the last two years as part of Flaherty's drive to balance the budget. The government is also following Emerson's recommendations to set up a Canadian Space Advisory Council and a committee of deputy ministers to help coordinate Canada's space efforts. While the new committees could help the space program, it is well known that committees do not necessarily lead to better policy or better results. And the Canadian space program was run by a committee during its first three decades of existence and suffered from the deficiencies of this form of governance. Liberal MP Marc Garneau, who before entering politics was Canada's first astronaut and a president of the CSA, dismissed Moore's statement as "mostly words and empty promises." He tweeted that "Minister Moore [is] having his initial love affair with Space. It will all soon be forgotten as it was with all previous Industry ministers." Although Garneau's statements were aimed at the Conservative government, they could also apply to past Liberal governments. Space has been a topic that has usually been neglected by governments of both parties (and we don't know how the NDP would treat this file), with decisions made usually only when they became urgent. The Harper government follows this historic pattern. In 2008 when Canada's largest space contractor, MDA, was about to be sold to an American company, the Harper government made the important and correct call to block the sale because of its national security implications. But four years later, the Harper government threatened the technical and organizational viability of the Radarsat Constellation program when it dragged its heels for nearly a year, probably for budgetary reasons, before agreeing to sign the contract that permitted production of the spacecraft. Harper's first industry minister, Jim Prentice, ordered up a space policy review soon after taking office, but the review was cancelled when Tony Clement replaced him, and the file continued to languish under Christian Paradis, who received Emerson's report last year. 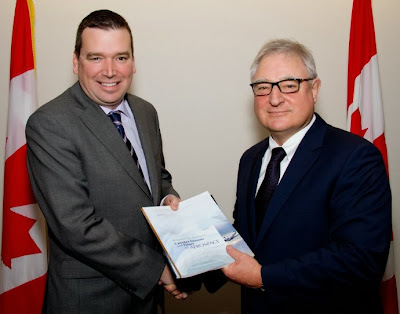 This summer new leadership came to Canada's space program in the form of Moore as the new industry minister, and former chief of the defence staff Gen. Walter Natynczyk, who became the first person who was not a civil servant or an astronaut to become president of the CSA. Even though Canada spends less on space than most G8 nations, investing just one quarter of what the United States does on space on a per capita basis, the Canadian space program has supported an industry that creates high technology exports of satellite systems and the Canadian jobs that go with them. This is in addition to the higher profile work on space robotics, space exploration, and astronaut flights. As for Monday's announcement, there was very little in it beyond promises of future action. The real results of the Harper government's review of the Emerson report will likely become clear or at least clearer early next year when the 2014 budget is tabled and the Space Policy Framework is revealed. How Much Instant and How Much Science? 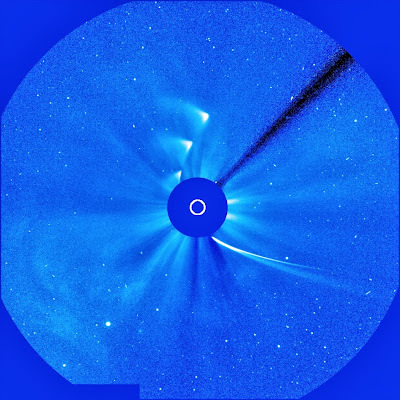 A NASA time-lapse image of Comet ISON before and after its closest encounter with the Sun on November 28, 2013, assembled from images taken by the NASA/ESA SOHO spacecraft. At the moment Comet ISON made its closest passage to the Sun last week, an interviewer asked me on a radio show exactly when we would know whether ISON had survived its encounter with the Sun. Up to that time, it appeared that ISON would either disappear near the Sun or survive to become the long heralded 'Comet of the Century' once it came closer to the Earth in December. I had not anticipated the interviewer's question about timing, and I responded that we could expect to have some idea of ISON's fate that evening, some hours after the interview. Barely an hour later, I began to see tweets proclaiming the end of ISON. The news was disappointing not only because it meant that there would be no more opportunities to see ISON, but also because I had given an incorrect answer about when we would know what happened to the comet. But as the hours went by, new images from SOHO and other space-based cameras revealed that ISON had reappeared, albeit in a severely reduced form. In the days since then, ISON has been fading away again. As Phil Plait said in his Bad Astronomy blog, it's been one surprise after another from ISON, and we are all wondering if there are more surprises in store. If there is one thing that's been consistent about the discoveries we have made about our solar system in recent decades, it is that they defy expectations. This is doubly true when it comes to comets. Comet Kohoutek fell far short of expectations 40 years ago, but we also have memories of the dramatic collision of the fragments of Comet Shoemaker-Levy 9 with Jupiter in 1994. Even if ISON does indeed disappear, it has already provided plenty of fodder for researchers. That's the one thing that was true a week ago as it is today. It turns out that we didn't get the full answer on ISON's survival when I thought we would. We may still not have that answer. Comet ISON has given us a good reminder to avoid the temptations of instant science. For many years I have written about space exploration, especially as it pertains to Canada, and related topics, including astronomy, other branches of science, and Canada's aviation industry. I have written for newspapers, magazines, academic journals, online publications, and four books, and I also talk about outer space on radio and television. I have had a lifetime interest in these topics and in history. After starting out as a newspaper reporter, I studied as a historian specializing in the history of technology and science. Now I am entering the blogosphere with Canadian Space, which will contain my observations about the topics I've just mentioned. I also plan to discuss some of the ideas below. In Canada today, the space and aviation industries are important parts of our economy. Communications, weather, remote sensing and navigation satellites, amongst others, form an important part of the infrastructure we all depend upon in our daily lives. When it comes to the exploration of space, Canadian spacecraft, scientists and astronauts have taken leading roles. Canadian astronomers are involved at the heart of today's important discoveries about the nature of our universe. Today we are living in a time when science is part of the political arena. Governments in Canada are succumbing to the tempting but questionable idea that there are quick and easy shortcuts to scientific advances that bring economic payoffs. Many of these same governments, along with corporate interests, are also attempting to brush off or deny scientific findings such as climate change that they find inconvenient.